Aseptic is a complete system of both processing and packaging a product. Aseptic products are thermally processed to a state of commercial sterility and then filled through a sterile zone into a sterilized package. Aseptic products are shelf-stable and do not require refrigeration. The aseptic process and packaging procedures allow longer shelf life, at normal room temperatures, without preservatives. Shelf life can be achieved (in some cases) for up to one year with out refrigeration. The product sterilization process is performed by rapidly heating the product to a high temperature, holding for a short period of time, and rapidly cooling the product. By processing in this manner, products are minimally affected by the heating process; thus ensuring flavor retention, nutritional value, and product integrity. The choice of system, system design, filler and package are very product dependent. In order to ensure product integrity and system efficiency, it is crucial that the choice of process, filler and package is made based on the particular product being processed. In the case of low acid products, the equipment, packaging and operation are subject to regulatory compliance in conjunction with a "filed process" with a process authority. The types of processes accepted in the United States for the production of aseptic products are time/temperature based. 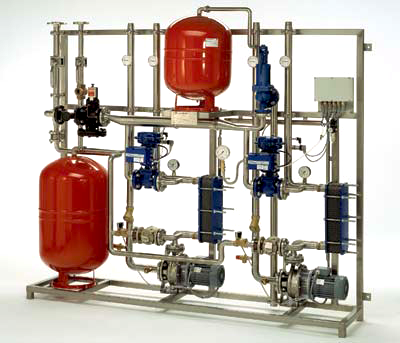 The two types of time/temperature based processing systems are categorized as "indirect" and "direct" heating systems. Indirect systems utilize non-contact heating and cooling media to achieve the desired product temperatures. These systems employ various types of heat exchangers such as plate heat exchangers, tubular heat exchangers, scraped surface heat exchangers, or in certain cases a combination of two or more of these, to heat and cool products to conform to the desired product temperature profile. Direct systems, like RS Automation’s newest system, utilize the incorporation of the heating media (culinary steam) directly into the product to rapidly elevate the product temperature. This heating process is in most cases followed by a flash cooling of the product to remove the quantity of water (as a flashing vapor) which was added as steam. Methods of delivering the steam into the product are either steam injection or steam infusion. Steam injection systems inject steam directly into the product, whereas steam infusion systems distribute the product into the steam via an infusion vessel. RS Automation has experience in the provision of both direct heating and indirect heating aseptic systems for both high acid and low acid foods. RS Automation can provide an aseptic solution for your product and packaging needs, that is certifiable by the FDA, USDA, or in the case of dairy based products the compliance with the Grade A Pasteurized Milk Ordinance (PMO). The product itself determines which of the requirements will need to be met. The demand of consumers worldwide is now leaning towards longer shelf life, more innovative packaging, and packaging that is more environmentally friendly. Aseptic processing fulfills all of these needs and more. Whether your product is intended for non-refrigerated storage, vending machines, or institutional distribution, the capabilities are endless; let RS Automation help determine, and in many cases increase, your Return On Investment on such an intriguing technology that not only gives you longer shelf life but a significantly better value-added product.